A lone soldier stands at the foot of a monument to another. Though much time has passed since the first soldier died at war… To the lone soldier, here it’s his brother. Our soldier, a pilot, hero of the last World War who went on to serve our community, with his wife, family and gave us so much more. Joseph Bannon- you make us all proud. 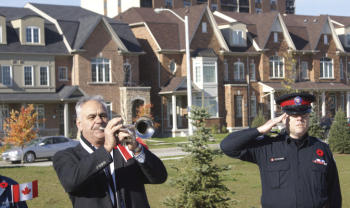 At this Remembrance Day gathering… there were no cannons blasting in the air just a moment of silence…followed by the sounds of a single trumpeter…TAPS (Thank you to Vittorio Mazzucca and your passionate trumpet skills). A group of local neighbors here to remember and share along with a lone soldier, Constable Mike Perreault who continues to show he cares. After travelling the world bringing peace to other countries, he now leads our Toronto Police Community Safety Division. Thank you for joining us at The Bannon Park, our lone living soldier and a lifesaving Peace Officer. Still serving us, his country in his own unique way. Hats off to Joseph Bannon, and the many others who went to war and died for us!